Withixi-UMS Business this can be used the Active Directory or the ixi-Usermanagement for the saving of the IXI-UMS user data and the IXI-UMS recipient number. ·If the users use the websites of ixi-UMS Business, you must send a password via email. ·One of the "extensionAttributes" must be defined for storing the ixi-UMS data. ·If no Microsoft Exchange is installed, a schema extension must be performed to store the ixi-UMS user data. You must specify how the domain for ixi-UMS messages should be. Users must then use them to address the outgoing UMS messages. ixi-UMS Business searches for the received number in the user administration via LDAP. When the ixi-UMS number is found, ixi-UMS Business reads out the accompanying e-mail address of the user and transmits the ixi-UMS-message to the Mail Server. 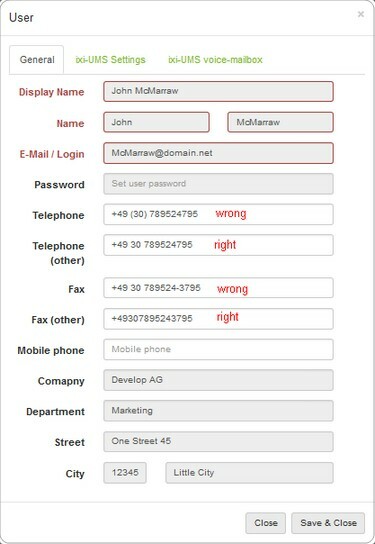 The default e-mail address and the ixi-UMS recipient number must therefore be specified in the user administration. Principally, every user in the company can get one or several fax- and voice-numbers assigned therewith. By Default, every user gets a ixi-UMS recipient number, on that all 2 sorts of messages can be received. The assignment takes place directly in Active Directory or in the ixi-UMS user administration and can be entered or modified via the user management interface integrated in ixi-UMS Business. The user is not assigned the extension but the full recipient number in the "E.164 format". An E.164 telephone number is a number in the so-called canonical format, this means it contains country code, area code, phone number and extension information. By default, the country code, area code and call number depend on the ixi-UMS Business site settings. The rights and permissions as well as the settings of the answering machine are stored in the LDAP database in the user object. If the connection to Active Directory with Microsoft Exchange Server is used, one of the 15 "extensionAttribute" (user-defined fields) supplied by Microsoft must be defined. This setting is not required when using ixi-UMS User Management. Depending on the mail server used, the <% PRODUKTNAME%> access must be set to the user mailboxes in the mailserver.